It's been almost eight months. Did you miss me? This year, I decided not to start my plants from seeds. Between having to shuffle the seedlings under the one tiny grow light I have and trying to keep my cats from eating the leaves, I decided it was too much hassle. 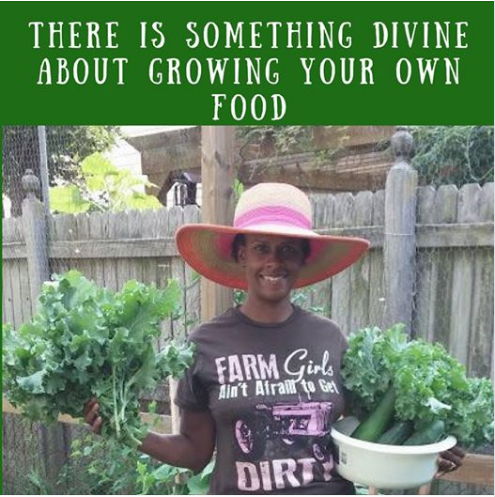 I plan on buying my seedlings from Papa John's Nursery, where I have been buying plants to supplement what I grow for the past 15 years. However, I am sad to say this is the last year that Papa John's will be open. After being a family farm for five generations, they have sold their land to Anne Arundel County to build a new school. I've had a couple of years to adjust to this, but it still makes me angry. You can read about it here. This year I'm scaling the garden back quite a bit. I'm the only one that maintains it and with all that I have on my schedule, I can't see myself having tons of plants to tend. Of course, once I get to Papa John's I'll probably lose my little planting mind and buy WAY more than I planned. But for now that's my story and I'm sticking to it. I plan on growing cucumbers, sweet and hot peppers, and several varieties of tomatoes. That's it. Hubby wants me to make lots of tomato sauce and salsa to can for the winter. My oldest son wants lots of pickles. My youngest son and my daughter want jalapenos. So, for now, that's what I'll be growing. Veggie plants will be up for sale in mid-April, so that is probably when you will see the next post from me, showing what I bought. You're probably wondering how my hens are doing. They are quite fine. 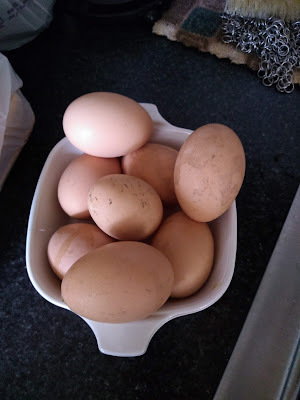 They've already started laying again, and they all still give me much attitude. But I love them. Here is a shot of them eating their favorite treat: mealworms. Wow, I go to check my reading list and there you are! Welcome back. Yes, I've come by to see if you're still blogging and am glad you're back. Also glad you are filled with your typical full-force enthusiasm! That's encouraging. Scaling back isn't always a bad thing, though. I've been doing the same but still growing a lot of what we eat. What a shame to lose your favorite nursery. We once had some friends who had property that their county wanted for a new school. Their choices were to either accept the offer the county gave them or have the property "condemned" and taken away. 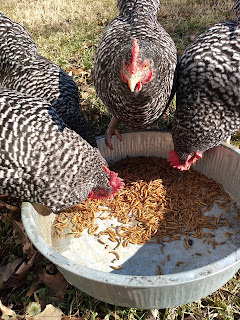 I didn't realize mealworms for chickens was such a productive food!